Bringing men into the gender equity conversation and breaking out of the “Man Box” is critical to closing the gender equity gap in our lifetime. The conversation surrounding gender equity has gained attention in recent months largely due to the social movements #MeToo, #TimesUp, and #WhatAboutUs. This global discussion is critical if we wish to end the gender equity gap inside business and shrink the estimated time to parity from 217 years globally, down to a number more comprehensible to the human brain. While the attention this issue has received is positive there is an important voice largely absent: the voice of men. The burden of advocating for gender equity has for years fallen largely on the shoulders of women. We don’t intend to insinuate that no men have taken a stand to fight alongside women in this battle of great social and financial significance—there are strong, vocal men who have stood shoulder to shoulder with women in this fight—the fact remains however, in the movement toward evaporating the gender equity gap, the voices of men have been muffled. If we wish to succeed in this lifetime, more men need to be involved in the conversation. Women’s voices ring clear but where are the men? To understand the issues surrounding gender equity we first have to understand the dynamics of power within political and financial circles that favor men. While the share of women in Congress in 2017 reached an all-time high, women still hold only 104 seats—just 19% of the total population of congress, while men hold 81%. Furthermore, 94% of the CEOs at Fortune 500 companies are male and perhaps more striking, there are fewer women of any name running large companies than there are men named ‘John’ running companies. Men are visible in the world of politics and business but the majority are absent in the fight to tear down long-held social norms that perpetuate the continuing cycle of gender inequity. Most of the deeply embedded social norms, traditions, and attitudes, upheld by men, are done so unwittingly. Many men don’t see or understand the issues surrounding gender equity and why would they? Men are born and grow to adulthood inside of a global culture that places a higher value on aggression, power, and strength, than it does on showing vulnerability and cultivating awareness. 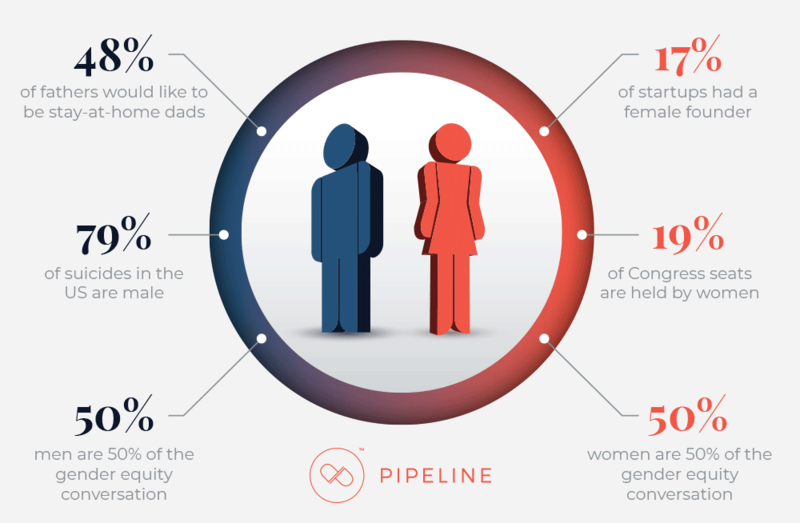 One of the reasons Pipeline focuses on gender equity as opposed to women’s equality is because we realize narrow definitions of gender harm both men and women – psychologically and economically. The alarming rates of suicide among men and boys are connected to these narrow definitions of masculinity. Suicide among males today is nearly four times higher than among females, and male suicides represent 79% of all instances of suicide inside the United States. RELATED: Forget Women’s Issues. Governments Need THIS. Bringing men into this conversation is critical to closing the gender equity gap and enables men to break free from the “man box”. By opening up space and encouraging this discourse among men and women we can save our boys from the notion that the only way to “be a man” is to assert control over others – often with tragic consequences. Men willing to acknowledge the issues surrounding gender equity and inequality are too often kept silent out of intimidation and uncertainty around when and where to enter the conversation. If we want to unlock the massive financial opportunity that will come with eliminating the gender equity gap, we need to begin a global conversation that includes men. Mistakes will be made and it will be awkward, but we will never reach gender parity in business within this lifetime—or at all—without the equal voices of both men and women. Men want to be included in this conversation. Despite the reluctance of men to insert themselves into this imperfect conversation, most want to be included. Men, like women, desire a different role in the world. In fact 48% of them would like to be stay-at-home dads. For men who want to take ownership over caring for children at home while their partner takes the lead inside the workplace, we owe it to them to remove the stigma associated with being a stay-at-home dad. The idea that caring for children is a women’s role is outdated and irrelevant. We need to free them from the “man-box”. We also owe it to boys and girls growing up or being born today to change the conversation surrounding gender roles—not only is it okay for boys and young men to be vulnerable and to express emotion; it is healthy. Long-held beliefs, attitudes, and traditions surrounding gender roles are damaging, and reinforce unhealthy stereotypes that move us further from the goal of closing the gender equity gap in this lifetime. As we continue to engage in difficult but important conversations, we need to become clear about a critical point: it is only with the active participation of both men and women that we will reach the goal of eliminating the gender equity gap in business in our lifetime, and unlock this massive economic opportunity.